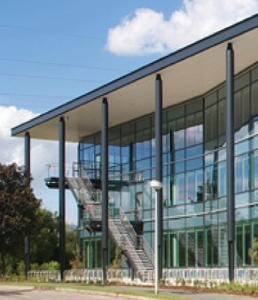 The creation of Building 101 involved replacing an original outdated 1979 single lot research and development building with a modern, sustainable and flexible headquarters building at the entrance to Cambridge Science Park in Cambridge - UK.Flexibility of this new building in the future was an important requirement and was reflected in the design of the glazed atrium street which allows for up to eight separate tenancies and gives opportunities for multi-letting, whilst additional floor height on the ground floor caters to a diverse range of occupancy from office functions through to small scale research and development.In the reception atrium at Building 101, there are three circular sky lights which required solar shading. The task was to design, manufacture and install three cylindrical features to a specified diameter and length, which would allow enough light through and help to improve the acoustics of the space. Created especially for the space at Building 101, the cylindrical features are designed to filter solar glare and are made with PVC film. Each cylinder was developed in different lengths to make the hanging features more sculptural.